See our: Art Nouveau jewelry. Art Nouveau: the style of decoration current in the 1890s and early 1900s, the name being derived from a gallery for interior decoration opened by Samuel Bing in Paris in 1896, called the "Maison de l'Art Nouveau". It was introduced in England circa 1890, mainly as a product of the movement started by William Morris and the pre-Raphaelites, which spread to the Continent and America. It came to an end with the outbreak of World War I. The Art Nouveau style in Germany was called Jugendstil, after a magazine called Die Jugend(The Youth), in Holland Slaoliestijl (salad oil style) after an advertising for salad oil and in Italy Floreale or Stile Liberty (after the London store that featured it). Applicable to all the decorative arts, it was adapted to jewelry in England and the Continent. 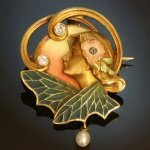 Art Nouveau style jewelry resulted from a revolt against the rigid styles of the previously mass-produced wares and a philosophy that sought to revive the craft movement and aestheticism in art. This jewellery style featured free-flowing, curving lines with asymmetrical natural motifs, such as human, female faces, greatly influenced by Japanese art. It used gemstones to emphasize their beauty, preferring pearls and cabochon opals and moonstones rather than faceted stones, and employed colourful enamelling.The pieces include pendants, necklaces and elaborate hair ornaments. Eventually its own extravagances led to its demise in circa 1910-1914. Among its leading exponents in France were Rene Lalique, Maison Vever, George Fouquet and Lucien Gaillard; in Belgium Philippe Wolfers and in Vienna Josef Hoffman. In England the leaders were Charles R.Ashbee and Henry Wilson and in Scotland Charles Rennie Mackintosh. Browse our catalogue and find some antique or vintage Art Nouveau style jewellery for example engagement rings, earrings, a brooch, pendant, necklace and many more.